or rolled-out in others, it is time to start looking at what it means to owners of telephone equipment. There are a variety of different types of NBN delivery, and the NBNCo choice of type to be used is often political. There are choices you will have to make too – and choosing to do nothing will have dire consequences. when the copper cable network is decommissioned. You could be without phones and internet for weeks (if not more), while you wait for your services to be switched over to the NBN. That’s not good for your business. FTTP – Fibre To The Premises. This is the original form of NBN delivery, chosen by the Federal Labor Party. This method also provides the fastest available data download speeds, as it brings the fibre connection into the home. The downside is the expense to provide the fibre connection in established properties. It also means that the “connection to the outside world” will be in a box, most likely in your garage, or similar. You will also need a power point near the new NBN connection box. You will need a licensed cabler to make a connection from the NBN connection box, to your existing telephone cabling, and also to your internet router (not many people have their router in the garage). Your existing telephone service(s) were delivered via copper wires from the Telstra/Optus network, but these copper wires will be redundant once the NBN conversion takes place. Quite often customers are not informed of this connection requirement by NBNCo (or their service provider), and are only aware of this when they find out that their dial tone is only available at an outlet on the NBN box in the garage. The internet signal out of the NBN box is different to an ADSL2+ signal. The NBN box is the actual modem. You will need a router (possibly with Wi-Fi) connected to the NBN box to use this signal. Some ADSL modems have a “WAN” port, which enables connection to the NBN box port. The modems that do not have a “WAN” port are rendered useless. Time to call Pinnacle Phone and Data. FTTN – Fibre To The Node. As soon as the Liberal-National Party coalition took office, the NBN delivery method changed to FTTN, as it was cheaper, easier, and quicker to roll-out. Little green metal cabinets began to pop up in suburban streets. These cabinets have a fibre connection to the outside world, and the final connection to your premises is via the existing copper wire cable running down the street. Each cabinet provides telephone and internet connection for several hundred customers. The length and quality of that copper wire cable will impact on the available data download speed that you will receive at your modem. Data download speeds will be less than that delivered via Fibre To The Premises. The new internet service is called VDSL, which is a different technology to ADSL2+. This again means that your existing ADSL2+ modem will probably need replacing. Your Internet Service Provider (ISP) may provide a new modem when you upgrade to the new NBN VDSL internet service. Even though the new NBN VDSL service is delivered to your premises over the existing copper wire cable, the analog telephone service that was your dial tone, will not be delivered over the same cable. You will be required to convert your existing analog land-line to become a VoIP service. If this is done with your ISP, your telephone service will ‘appear’ out of a “PHONE” port on the new VDSL modem. Your old telephone number will have been ported from analog PSTN technology in “Telstra world”, to become a VoIP service, which magically appears out of your modem. There are delays and down-time associated with porting numbers over to VoIP, but this is unavoidable. For residential situations, not requiring any more than 2x different phone ‘lines’, existing corded and cordless phones can be connected to the modem PHONE port(s). For commercial situations, requiring more than 2x different phone ‘lines’, another solution is required. This technology would be used in a multi-tenanted apartment building. The fibre cable is brought into the building, but the existing copper cabling would be used to deliver the NBN service to the individual apartments as a VDSL service. As with the FTTN technology, a VDSL modem router is used. The newest technology in the NBN arsenal. An NBN FTTC connection is used in circumstances where fibre is extended close to your premises, connecting to a small Distribution Point Unit (DPU), generally located inside a pit on the street. From here, the existing copper network is connected to the fibre to form the final NBN connection. 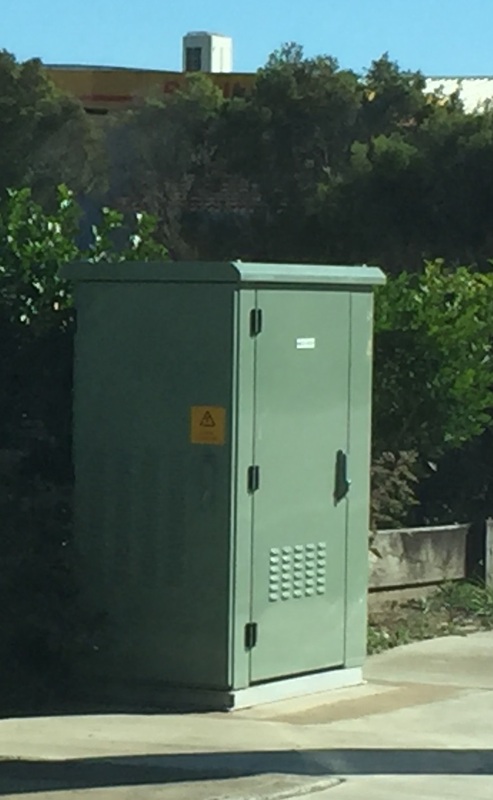 To power your FTTC service with electricity and provide your connection to the NBN broadband access network, an FTTC NBN connection box will be required inside your home or business. This is supplied by NBNCo, and forms part of their network. Your compatible Wi-Fi Router (Gateway) connects to this box with an Ethernet cable (supplied with the NBN connection box). As with the other technologies, your ‘landline’ will be delivered out of the PHONE port on the Wi-Fi Router. This version of NBN delivery uses the established co-axial cabling network previously built by Telstra to deliver the Foxtel and Bigpond Cable services. No fibre NBN box in the garage, and no use of existing copper wire cable for delivery of telephone or internet services. This method will use the existing Foxtel/Bigpond Cable outlet in your house, if you already have it. An outlet will need to be installed if you are not an existing Foxtel/Bigpond Cable customer. Your existing ADSL2+ modem is rendered useless. NBN supply a new cable modem, called the “NBN Connection Box”, and your ISP should supply you with a new Wi-Fi Router (called a Gateway). Your telephone service (if you choose to have one) will be delivered out of the Router via a dedicated “Phone” port. Business customers requiring 2x or more telephone ‘lines’ will again have to find an alternative method of making and receiving calls. In areas or regions where the deployment of Fibre cables is cost-prohibitive, NBNCo may choose to deliver the NBN network via Fixed Wireless. 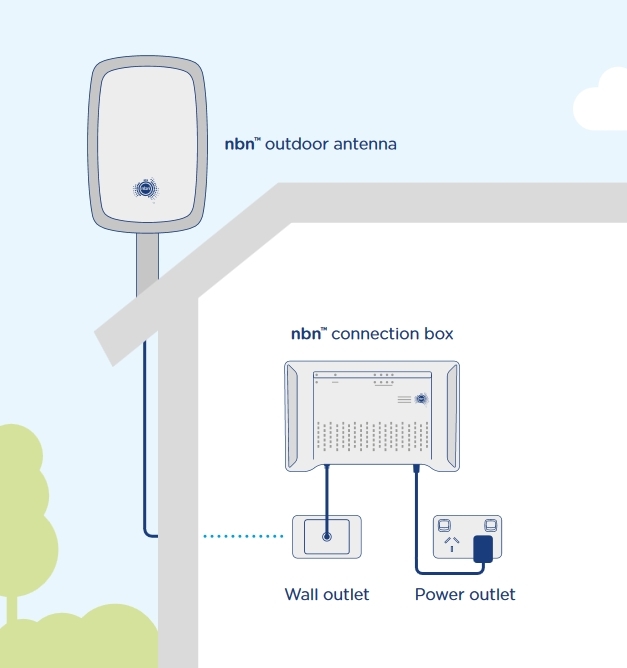 An NBN outdoor antenna is installed, with a cable to an inside wall outlet. This service is for the delivery of Internet signal only. The existing copper cable is retained for the landline(s). 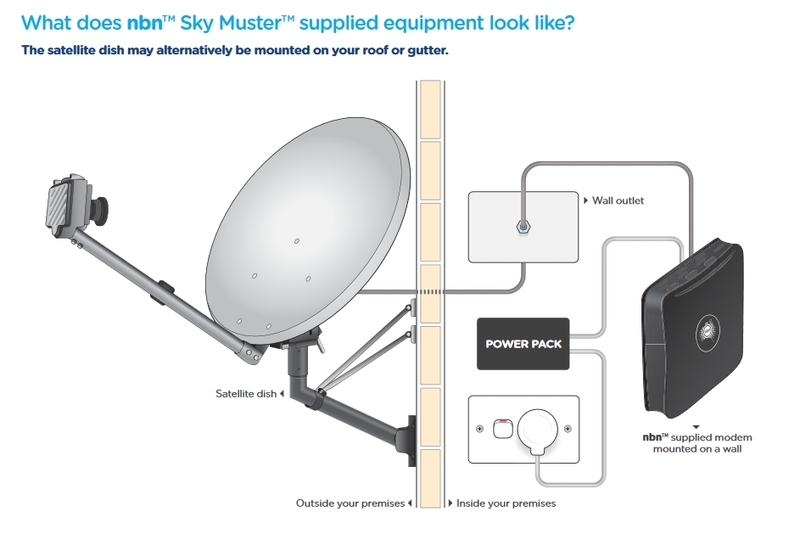 In remote areas of Australia, currently your only available method of NBN service is via satellite – this is called Sky Muster. As with Fixed Wireless, this is for the delivery of the internet signal only. There is no change to your landline delivery. What are your options if you have a multi-line telephone system with multiple handsets? The NBN service providers will inform you that your existing telephone hardware may be incompatible with the NBN, and encourage you to outlay more expense on a new VoIP telephone system. You may have spent $1000’s on a telephone system, and you are not ready to send it to the trash heap. A lot of telephone systems are more than 20 years old, and still providing good service. What if yours is only several years old? Why should you have to junk it because you are getting the NBN connected? If you delay, and hold off getting the NBN connected when it has been provisioned in your area, you will probably only have up to 18 months until the copper wire cable network is fully decommissioned. You don’t want to be left with NO DIAL TONE. It then becomes serious. That’s even worse than being left out of the Yellow Pages. Pinnacle Phone and Data has been working hard with technical support from a hardware supplier, and a local VoIP Service Provider. Together, we have come up with a good, working solution that will enable customers to keep their multi-line telephone systems, as well as enjoying the benefits of the cheaper ongoing costs of VoIP telephone services, and enhanced VoIP features. By connecting a small VoIP adaptor box to your new NBN modem, all of your analog PSTN circuits to your telephone system can be connected to the ‘little black box’, instead of the copper wire cables from the street. There are various models of the ‘little black box’, with the smallest providing just 1x analog line out, up to, a box capable of 48x analog lines out. For customers with digital ISDN lines connected to their telephone system, there are also VoIP adaptor boxes capable of providing either Basic Rate ISDN (2 channels), or Primary Rate ISDN (up to 30 channels). An added benefit of migrating over to this solution, is the free option of Voicemail for the VoIP services, as well as Email Notification of messages received. If your existing telephone system does not have inbuilt Voicemail, this is fantastic bonus for the operation of your business and for your callers. Let Pinnacle Phone and Data show you how to save money by keeping your existing telephone system, and by reducing your monthly phone bill. On the other hand, if you decide that it is a good time to upgrade your clapped-out antique telephone system, Pinnacle Phone and Data can get you kitted out with the latest smart IP desk phones. Either way, it’s your call. Just be sure to make that call to Pinnacle Phone and Data.